Private Gardens | Hanatoyo Landscape Co.,Ltd. 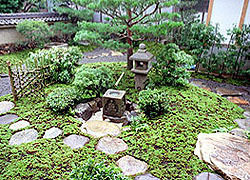 Gardens have been integral part of the structure in traditional townhouses in Kyoto — Machiya. Dubbed as “eels’ bed”, Machiya townhouse is a long structure with narrow frontage facing the street, standing side by side with its neighboring townhouses. 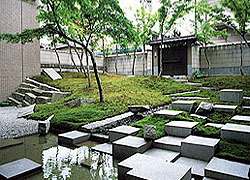 Toori-niwa (literally pass-through garden), stone-paved or earth floor passageway and Tsubo-niwa (One tsubo is approximately 3.3 sq meter), a tiny in-house patio, are meant to bring in light and air, and to make it easy to appreciate seasonal climate changes. 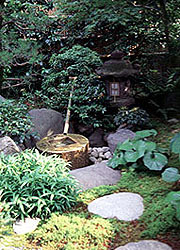 Our long experiences with various private gardens of different times and styles allowed us to inherit ideas and techniques necessary to design comfortable and sensible gardens. Today, gardens remain to be the amenity for our life, a source of comfort and delight. We offer best options fit for modern lifestyle and environment according to your preference. 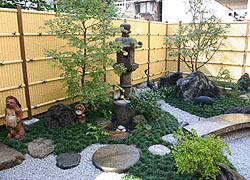 Feel free to consult with us on daily maintenance or improvement of your gardens — including Western-style ones. We also import authentic Western gardening materials from U.S., U.K. and other European countries, where we have working & training experiences.